ForumÂ is inspired by the monuments of nineteenth-century French town of Arles. 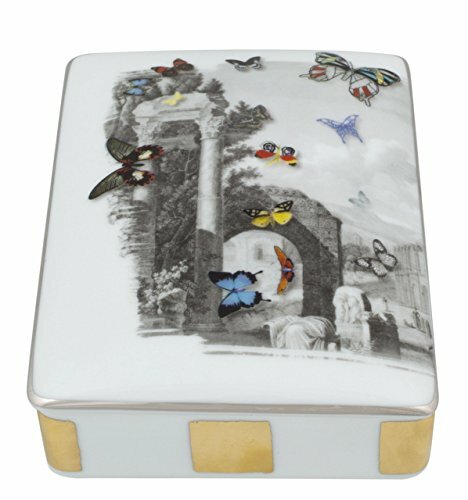 The landscape is overflown by the unmistakable butterflies of this collection. One of the four decorations of the Vista Alegre Christian Lacroix collection, representing the ""mix and match"" of the Christian Lacroix brand, allowing for mixing styles and shapes in a sophisticated manner. Material: PorcelainCare:Porcelain - Microwave and dishwasher safe.Porcelain with gold or platinum â€" Hand wash; not microwave safe. Biscuit (unglazed pieces) â€" Wash in warm water with a mild detergent. If necessary, use a soft brush.